D182. 2 Leave Passes named to 91672 Crawford D. E. A. of No 1 School of Technical Training. Dorothy Edith Alice Crawford enlisted on 4 Jan 1942 at Adelaide and discharged on 6 Nov 1946 from No 14 Signals Unit with the rank of Aircraftwoman. D183. 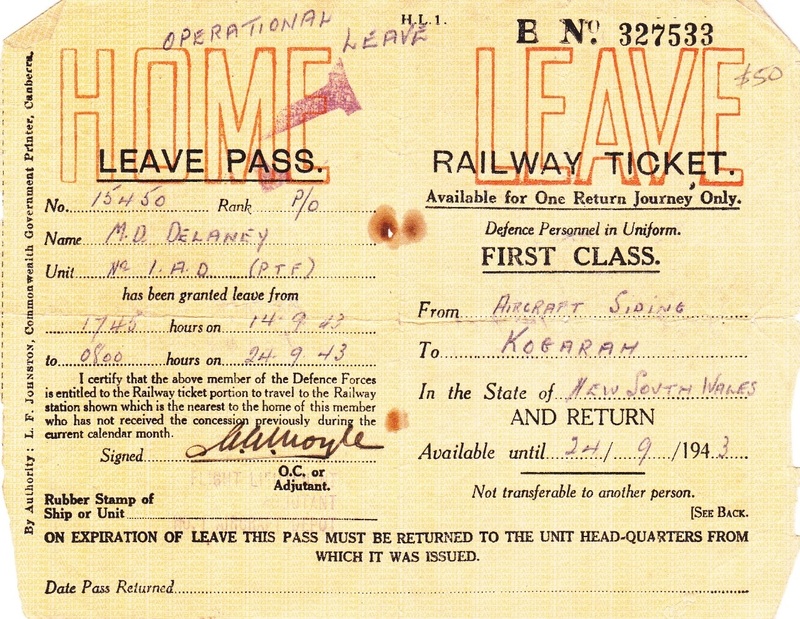 A Leave Pass named to 36456 Dehon R. of 2 Embarkation Depot. RAAF. Bradfield Park. Ronald Reginald Dehon enlisted on 23 Mar 1942 at Hobart and discharged on 18 Mar 1946 from 1AD Laverton with the rank of Leading Aircraftman. D183. Reverse of Leave Pass. D185. 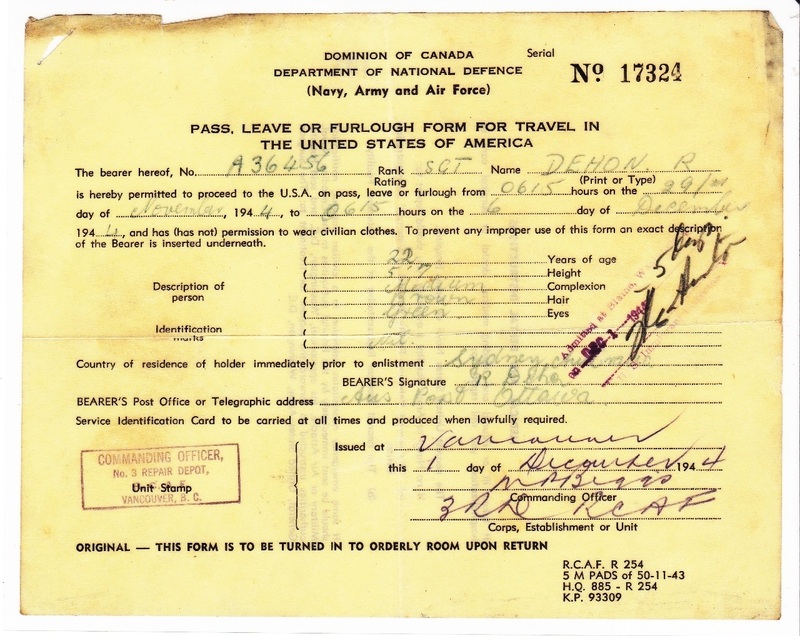 A RCAF Leave Pass named to 36456 Dehon R. R. of No 3 Repair Depot Vancouver. Ronald Reginald Dehon enlisted on 23 Mar 1942 at Hobart and discharged on 18 Mar 1946 from 1AD Laverton with the rank of Leading Aircraftman. D185. 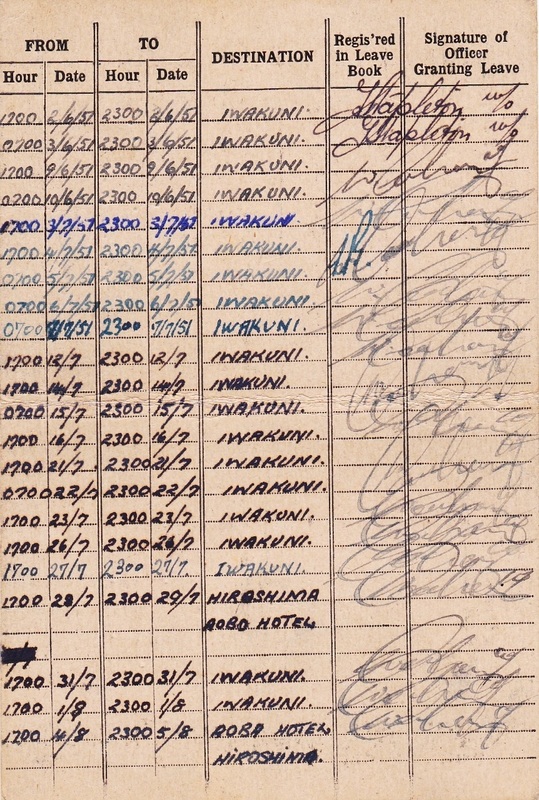 A RCAF Leave Pass named to 36456 Dehon R. R. Ronald Reginald Dehon enlisted on 23 Mar 1942 at Hobart and discharged on 18 Mar 1946 from 1AD Laverton with the rank of Leading Aircraftman. D186. 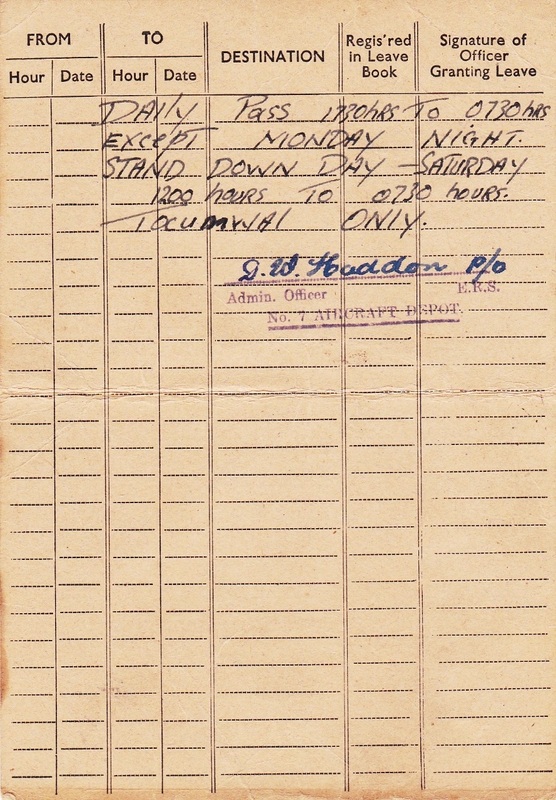 A RCAF Leave Pass named to 36456 Dehon R. R. of No 8 Bombing & Gunnery School Lethbridge. Ronald Reginald Dehon enlisted on 23 Mar 1942 at Hobart and discharged on 18 Mar 1946 from 1AD Laverton with the rank of Leading Aircraftman. D187. 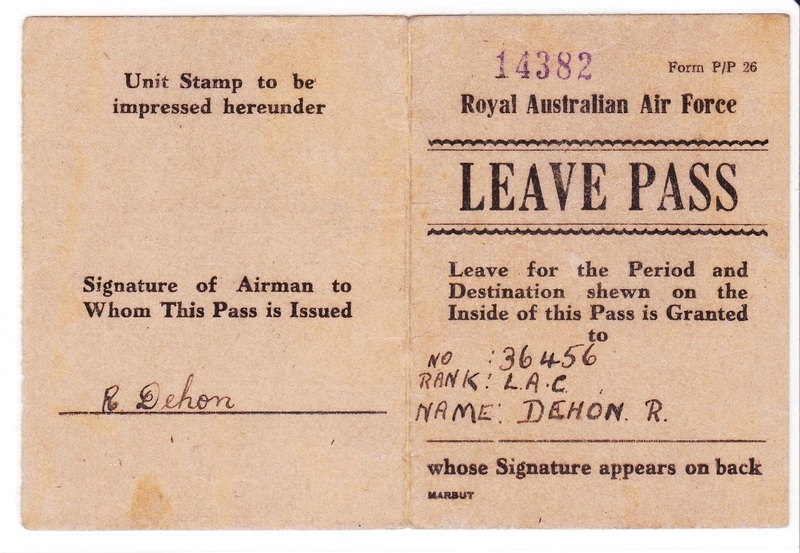 A RCAF Leave Pass named to 36456 Dehon R. R. Ronald Reginald Dehon enlisted on 23 Mar 1942 at Hobart and discharged on 18 Mar 1946 from 1AD Laverton with the rank of Leading Aircraftman. D188. 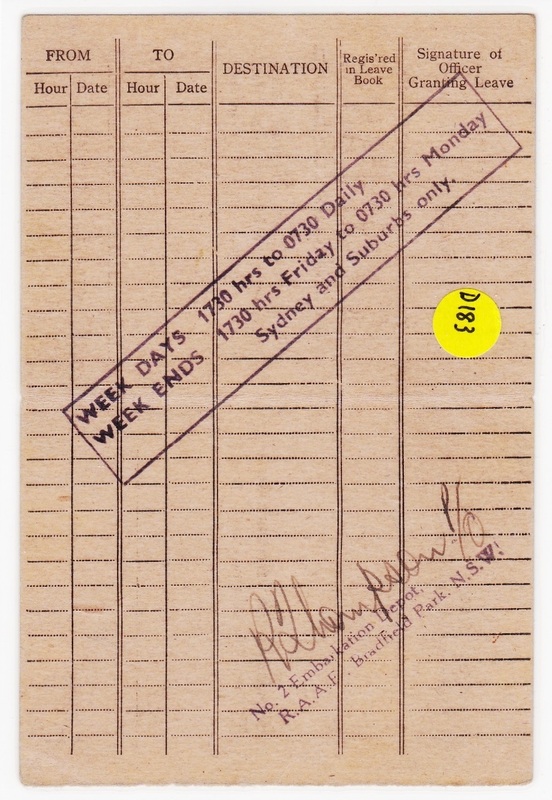 A RCAF Leave Pass named to 36456 Dehon R. R. of No 8 Bombing & Gunnery School Lethbridge. Ronald Reginald Dehon enlisted on 23 Mar 1942 at Hobart and discharged on 18 Mar 1946 from 1AD Laverton with the rank of Leading Aircraftman. D188. 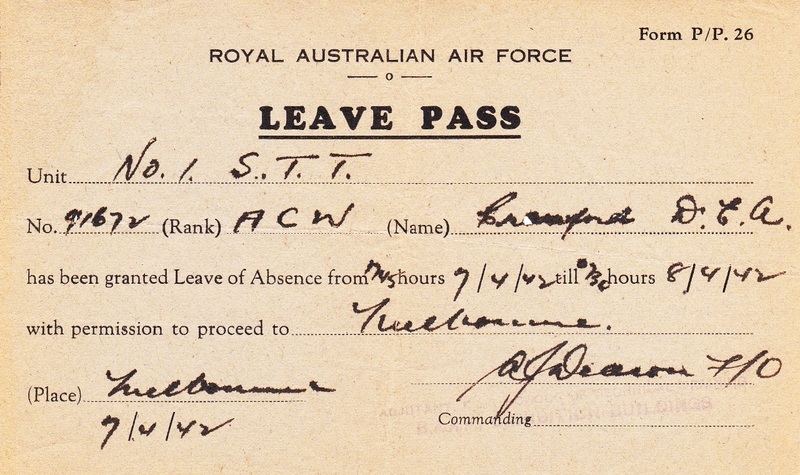 Reverse of Leave Pass. D189. 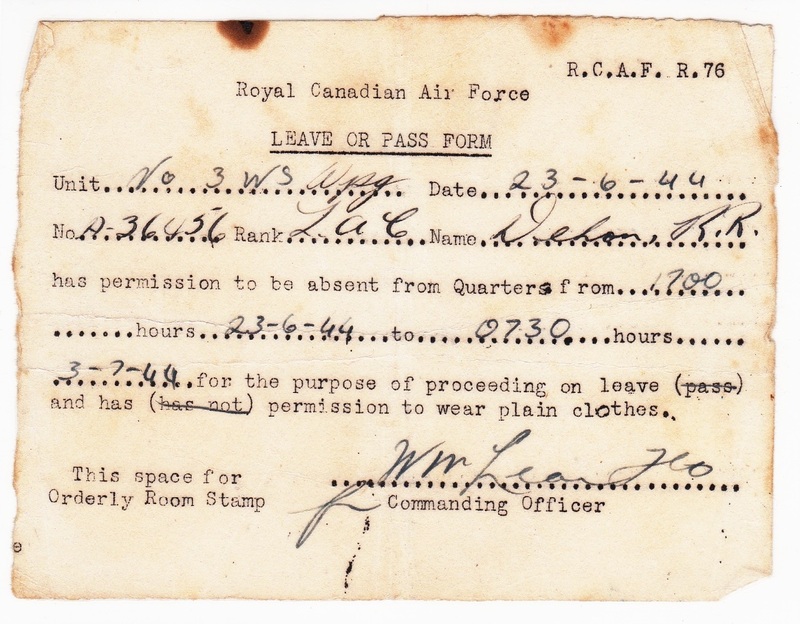 A RCAF Leave Pass named to 36456 Dehon R. R. of No 8 Bombing & Gunnery School Lethbridge. Ronald Reginald Dehon enlisted on 23 Mar 1942 at Hobart and discharged on 18 Mar 1946 from 1AD Laverton with the rank of Leading Aircraftman. D189. Reveres of Leave Pass. D190. 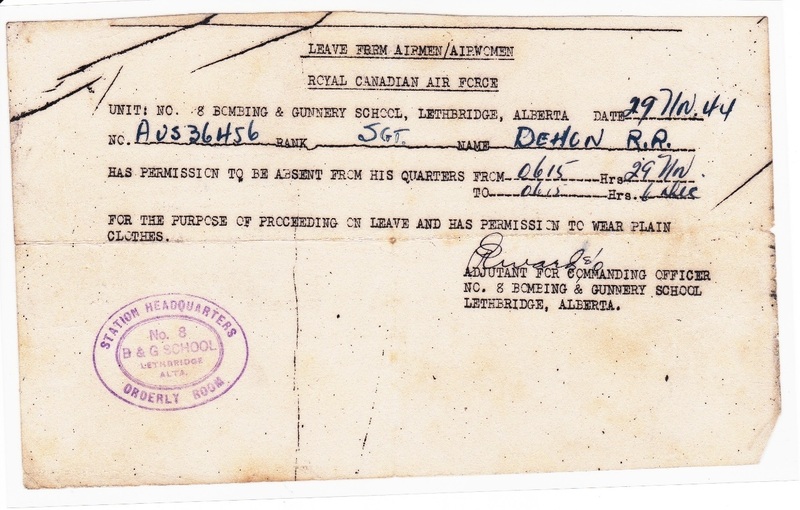 A RCAF Leave Pass named to 36456 Dehon R. R. of No 8 Bombing & Gunnery School Lethbridge. Ronald Reginald Dehon enlisted on 23 Mar 1942 at Hobart and discharged on 18 Mar 1946 from 1AD Laverton with the rank of Leading Aircraftman. D247. 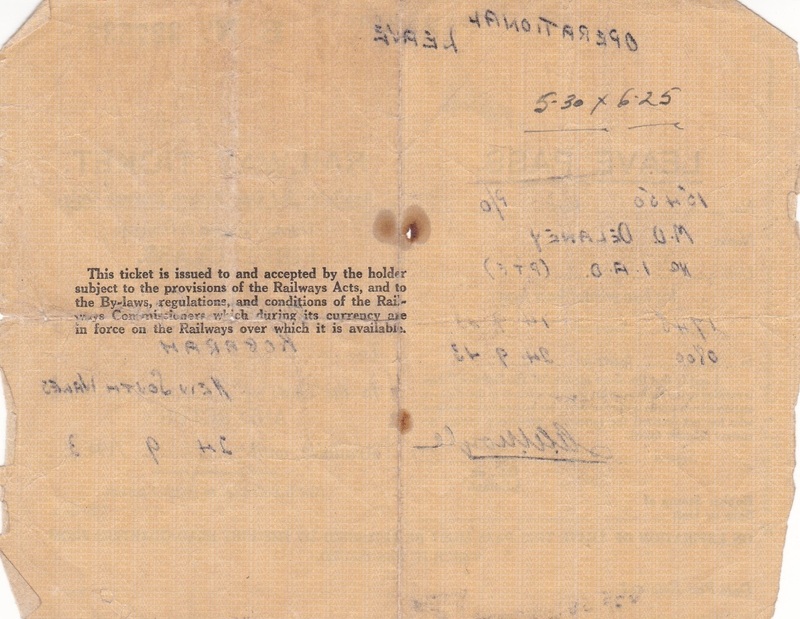 A Leave Pass and Railway Ticket named to 15450 Delaney M. D. Michael Dormer Delaney enlisted on 2 Jun 1940 at Sydney and discharged on 31 Aug 1948 from Eastern Area Headquarters with the rank of Flight Lieutenant. D247. Reverse of Leave Pass. D330. 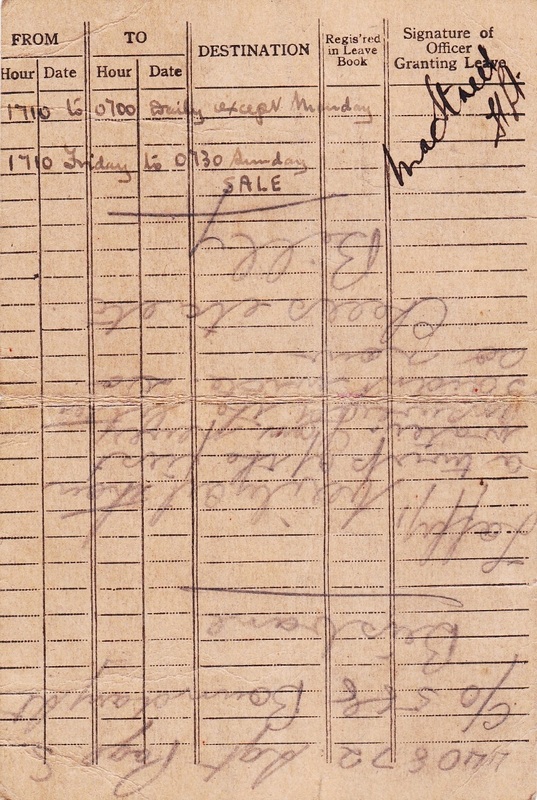 A Leave Pass named to 145528 Itzerott W. G. of No 7 Aircraft Depot. Wilfred George Itzerott enlisted on 18 Nov 1943 at Melbourne and discharged on the 8 Mar 1946 from R Stn Port Moresby with the rank of Leading Aircraftman. D330. 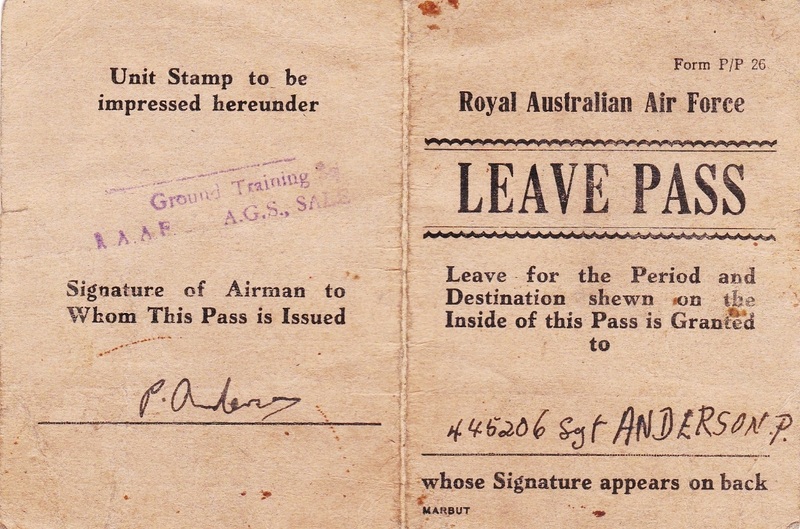 Reverse of Leave Pass. D444. 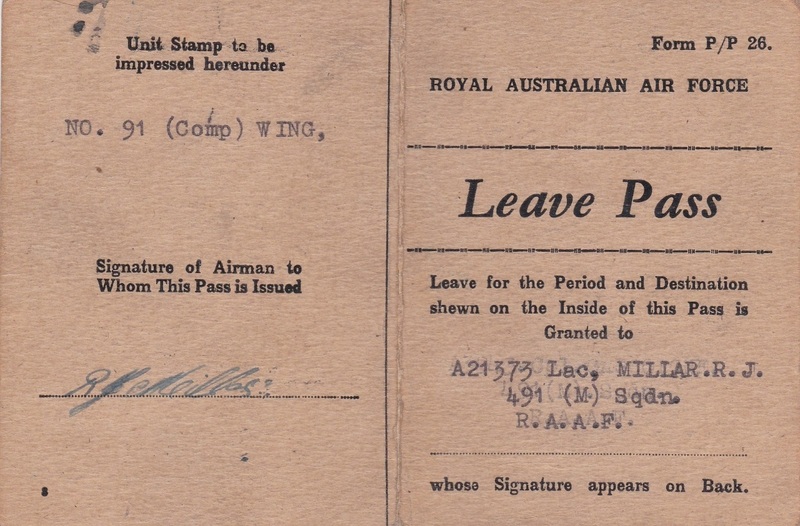 A Post War Leave Pass named to A21373 Millar R. J. of 491 (M) Squadron. D444. 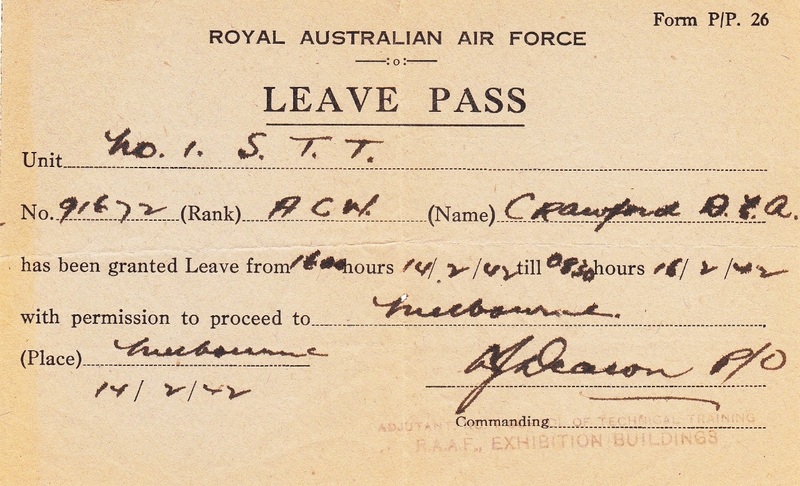 Reverse of Leave Pass. D646. 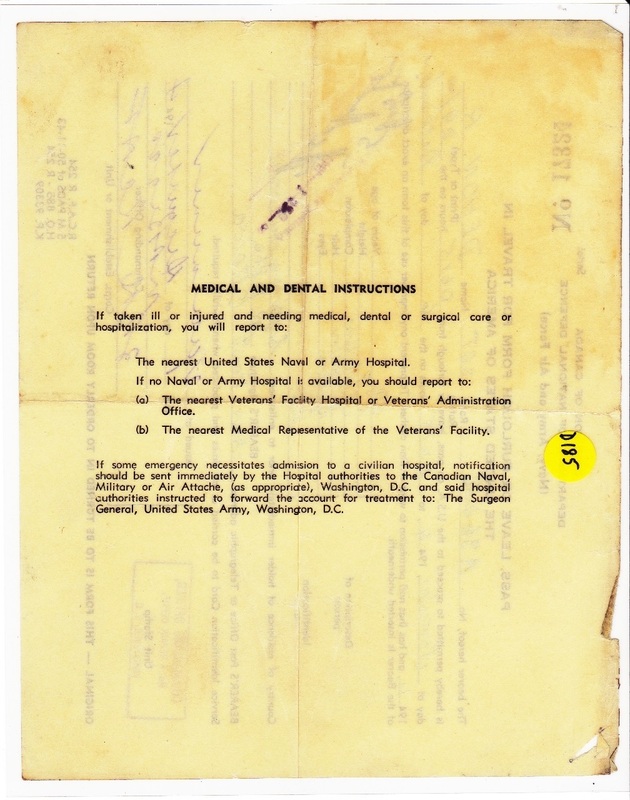 A Leave Pass named to 445206 Anderson P. Paul Decimus Anderson enlisted on 20 May 1944 at Sydney and discharged on 4 Oct 1945 from Air gunnery School West Sale VIC with the rank of Flight Sergeant. D646. 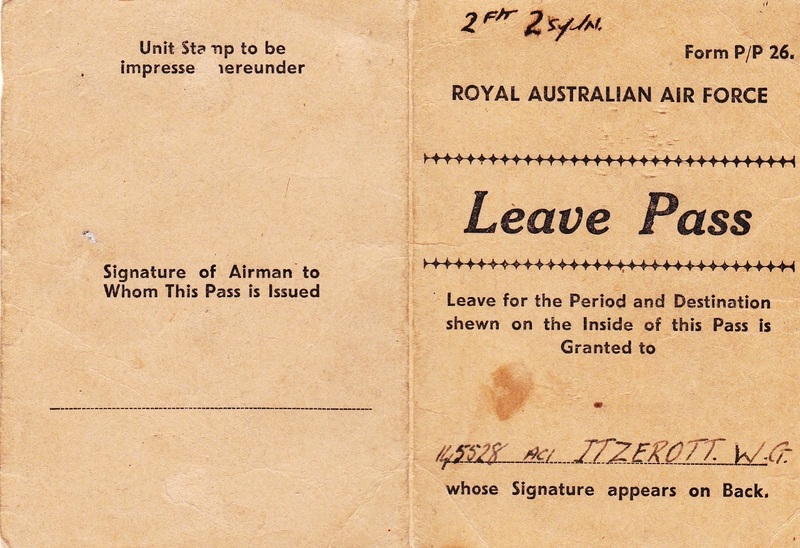 Reverse of Leave Pass.